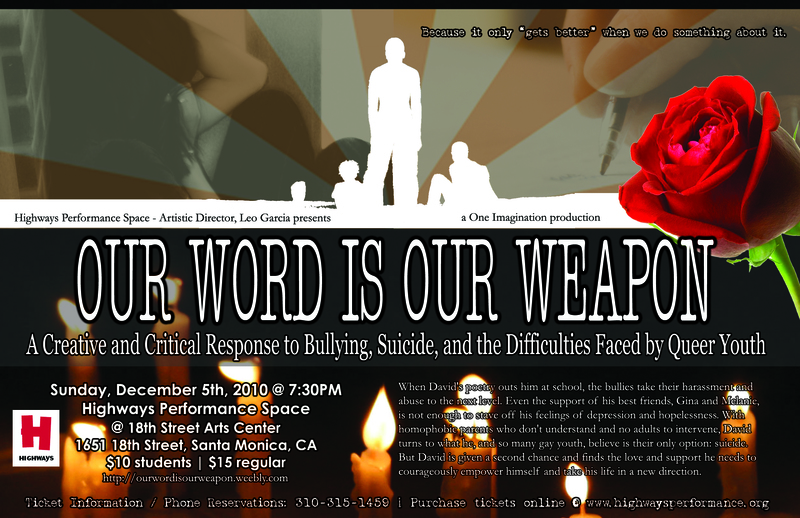 One Imagination's OUR WORD IS OUR WEAPON is a multidisciplinary production centering the struggles of David, a gay high school student and writer, taking place Sunday, December 5th, 2010 at Highways Performance Space in Santa Monica. Los Angeles, CA – November 2, 2010 – Responding to the recent gay teen suicides in the media, One Imagination’s OUR WORD IS OUR WEAPON is a raw and deeply moving multidisciplinary show following the life of David, a gay high school student and writer, overcoming his struggles with bullying, depression, intolerance, harassment, and violence. With the support of his friends and one brave teacher, David navigates his way to break the silence on this pervasive culture of violence and embrace his weapon of choice: words. One Imagination, founded in 2007, is a social justice arts collective based in the Long Beach, South Bay, and South Los Angeles area. Over the past three years, One Imagination has offered a variety of conscious, artistic programs including Break the Silence open mic, creative writing workshops, community film showings, and youth leadership sessions. In the spring of 2010, One Imagination implemented an eight-week leadership, writing, performance, and mentorship program for middle school and high school aged students called Our Word is Our Weapon or OWOW (pronounced oh-wow). A group of OWOW youth poets with the support of One Imagination artist-organizers even went on to represent Long Beach in the Brave New Voices International Youth Poetry Slam Competition this past summer in Los Angeles. During the fall, a group of young people ages 16 to 32, came together in a series of writing and performance workshops to create a multidisciplinary production entitled OUR WORD IS OUR WEAPON. Focusing on the topic of violence, this group has shared, discussed, cried, laughed, hugged, and written their truth and experience into the show now known as OUR WORD IS OUR WEAPON. We hope that our efforts to heal from our own experiences with violence, to attempt to understand why people bully and hurt others, and to envision a space where we treat each other with respect, love, and dignity is one in which you can identify and relate. We recognize that silence is not an option when so much injustice and suffering exists in the world. Expressing ourselves through written, oral, and visual mediums is a step towards healing, and perhaps a step towards unlearning the thinking and behavior that this violent culture has ingrained in us. This is only the beginning. 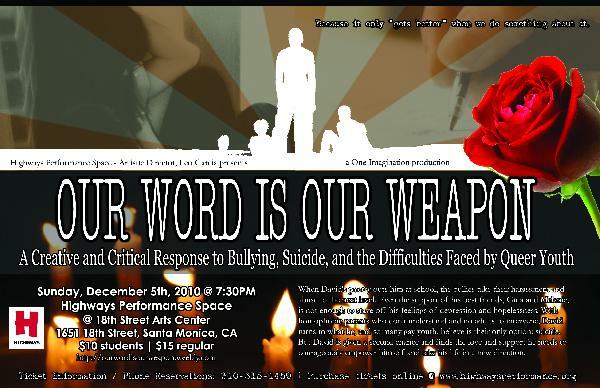 To read and learn more about OUR WORD IS OUR WEAPON and its performers, visit http://ourwordisourweapon.weebly.com. NOTE TO EDITORS AND PRODUCERS: Carina Clemente is currently available to be interviewed about the OUR WORD IS OUR WEAPON performance. To set up an interview or reserve press passes to this event, please call Carina directly at 310-795-6388 or e-mail oneimagination@gmail.com.